From Grand Hotel Tremezzo’s floating pool on Lake Como to Thailand’s infamous red pool at The Library, there are countless hotels around the world that are worth booking for the pool itself. Scroll on the see some of the finest hotel pools to dive into — and to ‘gram. Image courtesy of Jackalope Hotels. Since opening the doors to its jet-black, zinc-clad exterior last April, Jackalope Hotel swiftly became Australia’s hottest new hotel. While it’s glorious location at heart of its own boutique vineyard on the Mornington Peninsula and its heritage-meets-modern structure filled with award-winning interiors have no doubt been the secret to its success, there’s no denying it’s 25-metre, black-tiled infinity pool has played a huge part in winning its first guests over, too. If you haven’t yet seen it on your Instagram feed, you obviously haven’t been scrolling. Image courtesy of Halcyon House. As one of Australia’s most luxurious getaways, it’s only fitting that Halcyon House is home to one of the most Instagram-worthy pools in the country. If it’s beach front pool framed with blue and white stripe sun lounges, crisp white umbrellas and palm trees isn’t the setting for a quintessential Australia summer, we don’t know what is. Image courtesy of Grand Hotel Tremezzo. Why just take in the picturesque views of Lake Como when you could swim on it, too? Grand Hotel Tremezzo’s floating pool — known as “water on water” — rests on the lake’s surface making for one of the most unique hotel swims in the world. While you’re taking a dip, look back and admire the hotel’s breath-taking palatial structure or take in the views of Bellagio across the lake. Image courtesy of Les Roches Rouge. 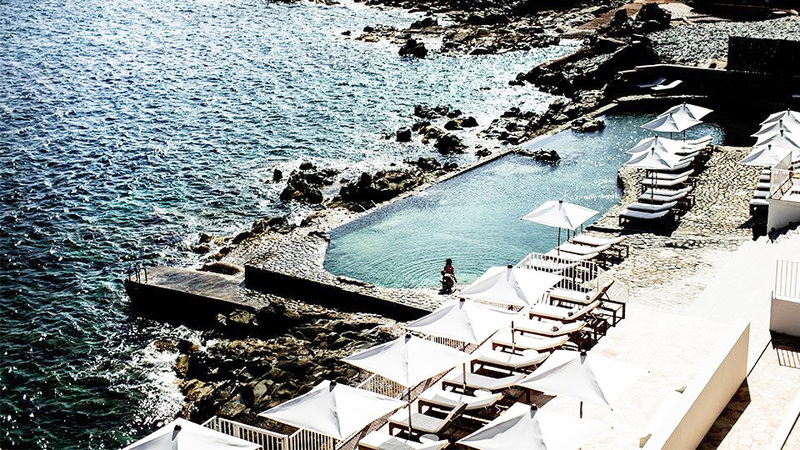 If holidaying on the French Riviera wasn’t already the definition of vacation goals, then try booking into the famed Les Roches Rouges at Saint-Raphaël and taking a dip in its 30-metre natural seawater swimming pool that is cut into the coastal rock of the Mediterranean coastline. Welcome to paradise. Image courtesy of King Street Townhouse. The meaning pool with a view is defined at King Street Townhouse in Manchester. Located on the hotel’s 7th floor, the heated infinity spa pool boasts one of the most beautiful outlooks in town by overlooking the clock tower and spires of the Manchester Town Hall. BYO waterproof camera, you’re going to need it. Image courtesy of Alila Villas. Sitting atop a panoramic plateau above lime stone cliffs with the sweeping ocean below, Alila Villas Uluwatu is one Bali’s most charming resorts. One of its most impressive features is it’s 50-metre infinity pool that boasts a dramatic, yet equally spectacular view over the Indian Ocean. Its only downfall is once you’re in, you’ll never want to get out. Image courtesy of The Library. Located just a few steps away from the white sandy shores of Koh Samui’s Chaweng Beach, The Library’s signature red pool is a vision. Created by mosaic tiles of orange, yellow and deep red, this pool is unsurprisingly one of the most talked about hotel pools in the world. Book now, because you have to see it to believe it. Image courtesy of Oberoi Udavillas. The best and only way to describe the pool at Udaipur's Oberoi Udavillas is with two words: overwhelmingly beautiful. The expansive, fifty-acre hotel is built on the shores of Lake Pichola overlooking the Lake Palace and the City Palace, and it’s wrap-around, moat-like pool therefore offers arguably the city’s most photogenic views. Prepare yourself for the most picturesque swim of your life.